On May 2, Global Trade Review, a worldwide authoritative magazine in trade financing held its annual award ceremony in London, UK. 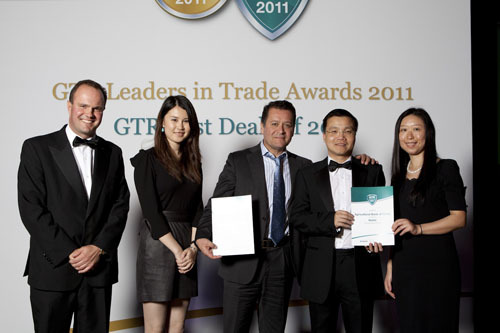 Agricultural Bank of China Limited (ABC) won the award of Best Deals of 2011 for its CERs advance payment financing business with the Noble Group Limited and the Jigang Group Co., Ltd. Altogether 30 transactions from different countries and regions won the award this time, among them ABC was the only Chinese bank. Representatives from ABC London subsidiary and Singapore Branch attended the ceremony and received the award on behalf of ABC. The award-winning business is ABC’s first CDM-based carbon credit transaction financing business, and also the first structural carbon credit transaction financing business in China’s financial industry. Through structure design for pre-export advance payment financing and linkage between domestic and overseas branches, ABC helps Chinese enterprises gain benefits out of international trading mechanism in their energy-saving and emission reduction projects, realizing win-win situation for multiple parties. The Global Trade Review covered the above business in a feature report. ABC is dedicated to helping more customers improve their market competitiveness and value creativity through product innovation. China has a large number of energy-saving and emission reduction projects, and is also an important participant in the international commodity market. ABC will not only keep supporting domestic energy-saving and emission reduction projects, but also step up efforts in tapping into the great potential in commodity market and capital market, so as to provide better service for customers and make contribution to society.